Home Tennessee Why the Omni in Nashville Is an Awesome Downtown Hotel? 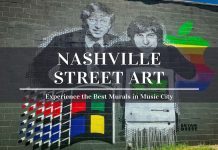 Anyone visiting Nashville will ultimately have to decide which area they want to stay given that there are so many options available depending on your personal preference. 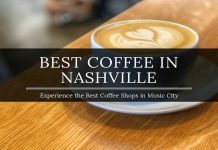 In recent years, Nashville has become an increasingly popular spot for visitors from around the world and certainly for good reason. If you choose to stay downtown and enjoy the ultimate Broadway experience while having easy access to other iconic attractions, we have the perfect hotel for you. 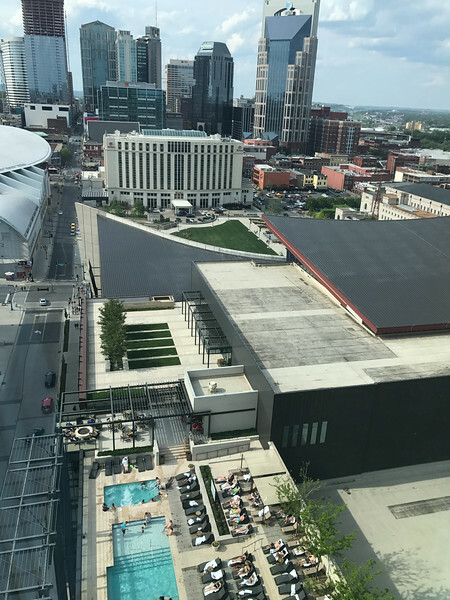 The Omni in Nashville is perfectly located and offers a luxury experience that in our opinion, is unequivocally the best throughout the city! Nashville is undoubtedly the home of country music! But don’t let folks fool you if they try to convince you that a trip to Nashville is all about cowboy boots and listening to the likes of Dolly Parton or Johnny Cash. 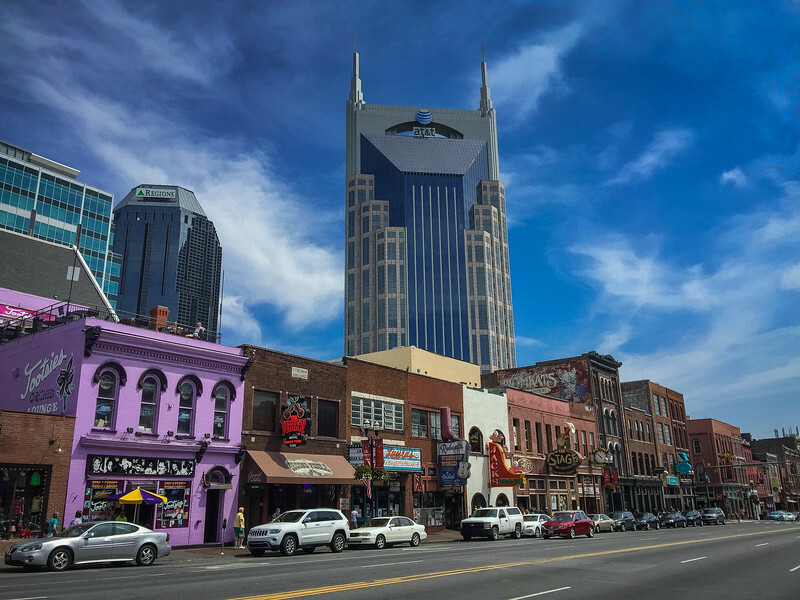 Music City is a thriving metropolis in the heart of Tennessee that deserves way more credit than any negative stereotypes that float around and spending a weekend in downtown Nashville offers the opportunity to lay these claims to rest. 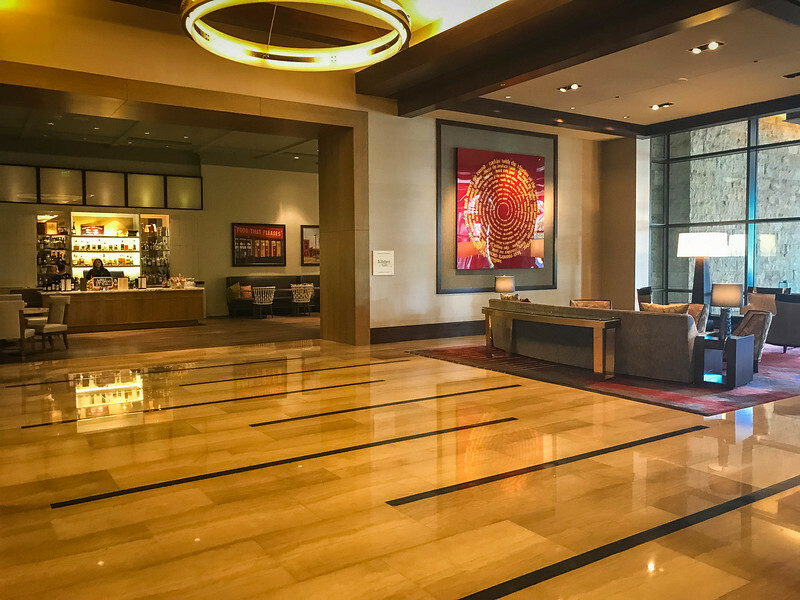 Having stayed at a number of alternative establishments around the surrounding suburbs, we were excited to stay at the Omni in Nashville. 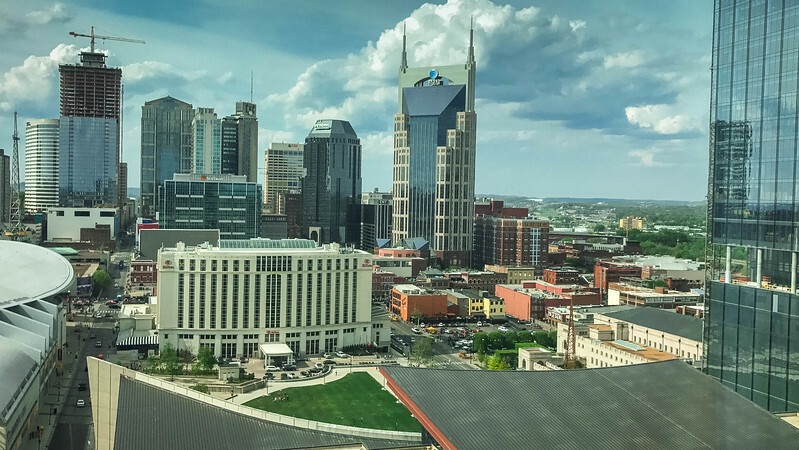 Let’s take a look at exactly why this hotel should be high on your bucket list of possible accommodation options the next time you plan a trip to Music City! As I indicated, the Omni in Nashville is in the perfect downtown location to explore this part of the city. 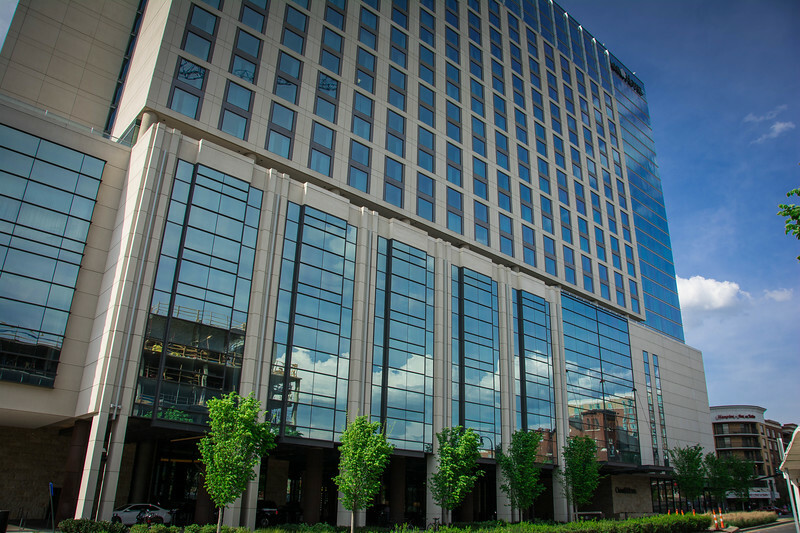 Located directly beside the Country Music Hall of Fame, the Omni Nashville Hotel is just a block away from Broadway and a few minutes from iconic attractions such as the Ryman Auditorium, Bicentennial Capital Mall State Park among many others. Convenience to nearby attractions, restaurants, and public transportation is understandably a critical component of any hotel that we consider before booking an overnight stay. 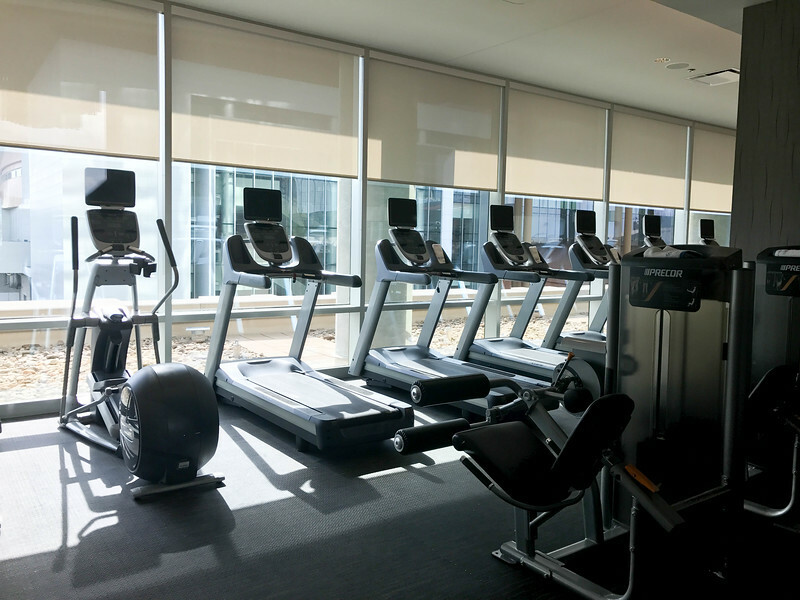 The Omni Nashville Hotel checks all of these boxes and more! Parking is either via valet service which costs $34 for the full day or self-parking is available at the nearby Music City Center parking garage. This is definitely our recommended route given that it’s just a short walk from the hotel entrance and at only $12 for an overnight stay (if you are at the hotel for less than 10 hours, otherwise it’s a maximum charge of $18) it’s a real bargain in a downtown metropolis. 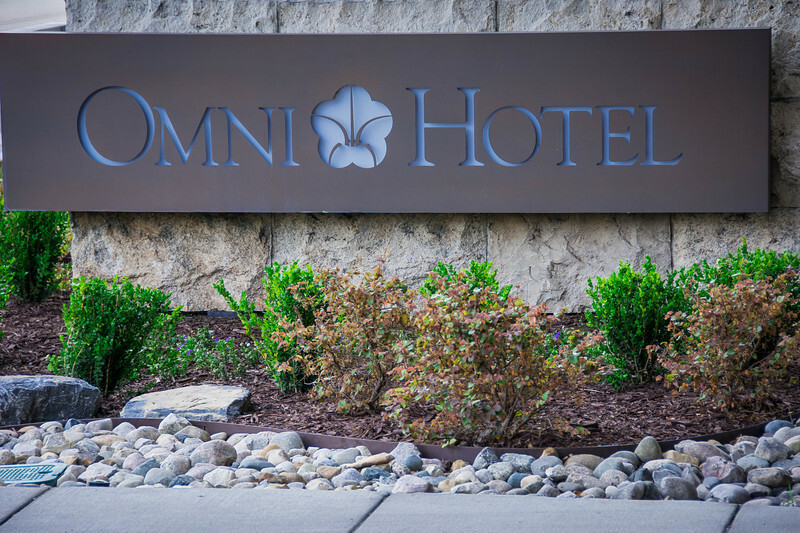 As with all luxury hotel brands across the globe, the Omni Nashville offers guest the opportunity to experience everything you could wish for in a hotel stay. Full-service business center to meet all of your needs if you are in the city for work. 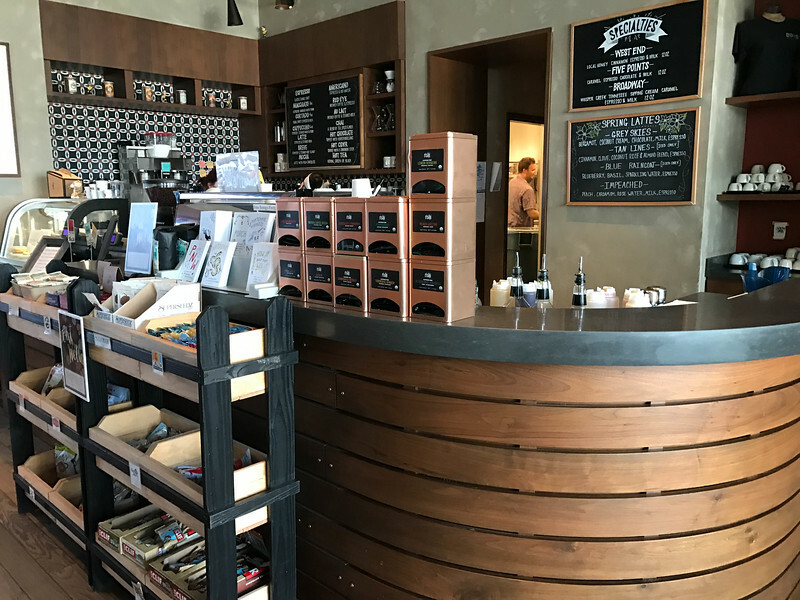 Three unique and diverse restaurants offering a variety of cuisine options, in addition to Bongo Java Coffee Shop to start your day with a favorite espresso beverage. Internal easy access to the Country Music Hall of Fame. Over 800 guest rooms and 54 extravagant suites. It’s hard to envision such a spectacular hotel without actually experiencing it for yourselves, as words and pictures can barely do this justice. We have given you the basic facts at the Omni, so let’s share our very own experience as we enjoyed an awesome weekend in Nashville. 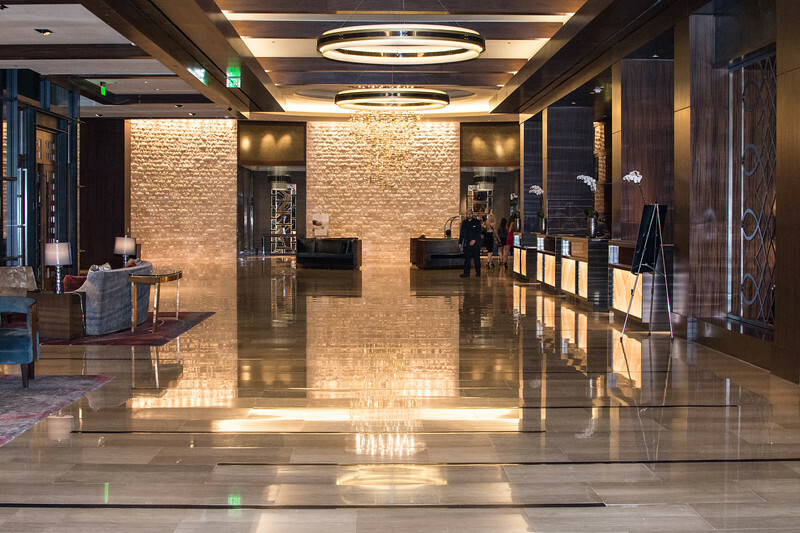 Walking through the revolving doors of the Omni Nashville Hotel, you are immediately encapsulated by the modern decor and energy that reverberates across the lobby. 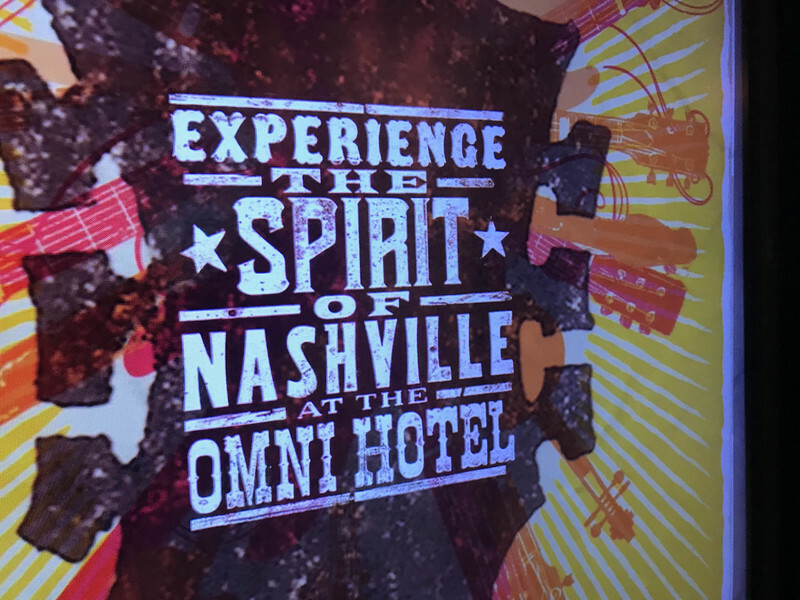 We instantly realized that the Omni brand was solely focused on emphasizing the Nashville culture and creating an extension of the trendy vibe that you can’t help but notice as you explore the city. 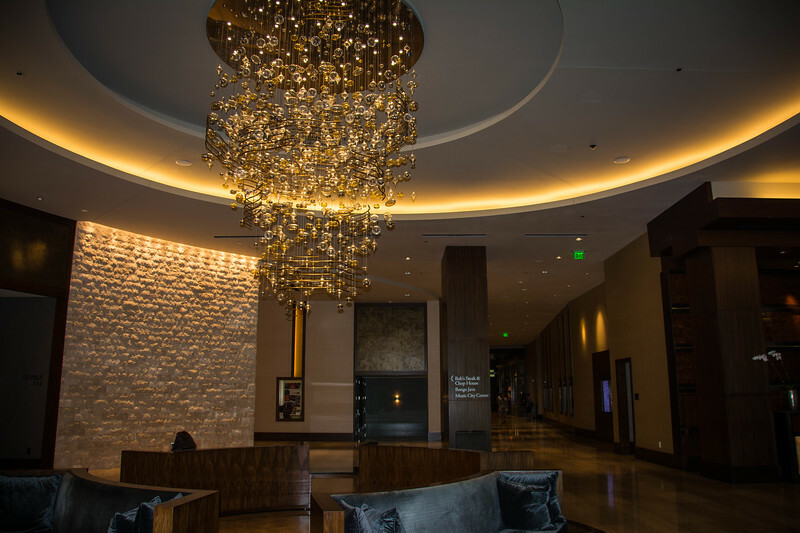 The Omni Nashville Hotel is created specifically to be an authentic expression of the city’s vibrant music culture. 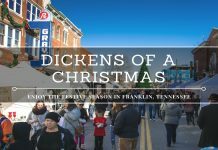 I’m sure by the time you finish reading this review, you will be ready to visit Music City and make a reservation at the Omni Hotel! 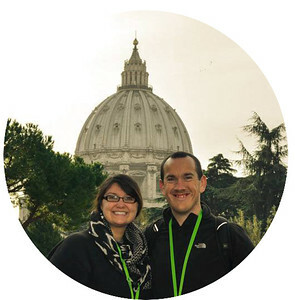 Any hotel experience is ultimately dependent on the guest and exactly what you are expecting. We always enjoy spending time in the lobby area to either catch up on some work or relax with our favorite beverage. 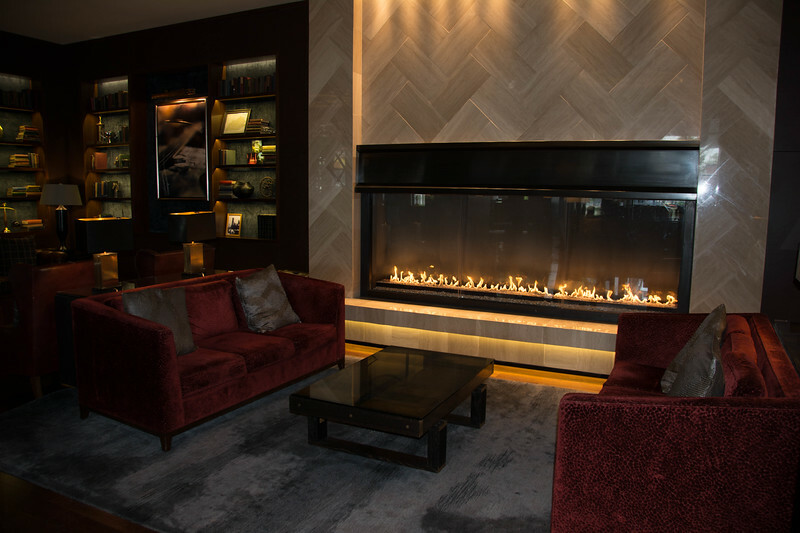 The Omni Nashville Hotel is certainly in the very high echelons of luxurious lobby areas. A number of seating areas are available in addition to a relaxing library where you can enjoy a more “home” experience with your favorite novel in front of the fireplace. 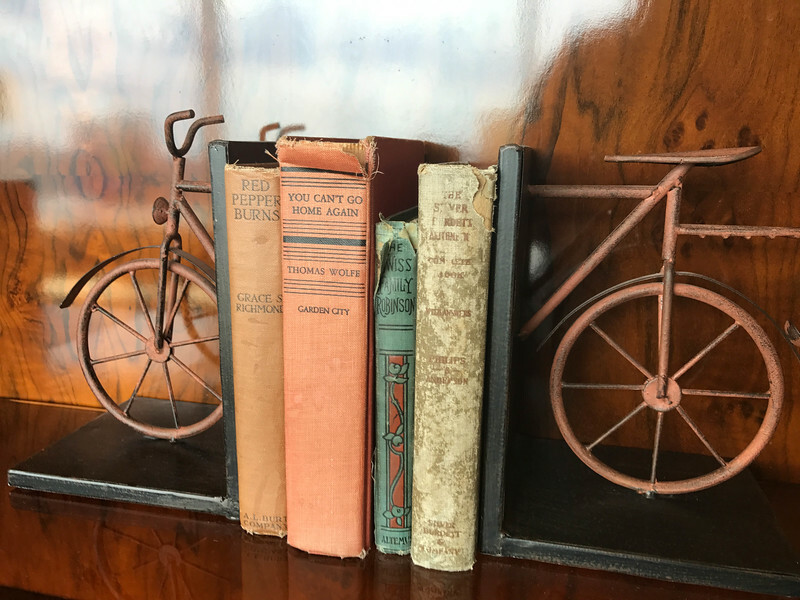 The decor throughout the lobby is consistent with the rest of the hotel and certainly illustrates the philosophy the Omni brand is associated with. 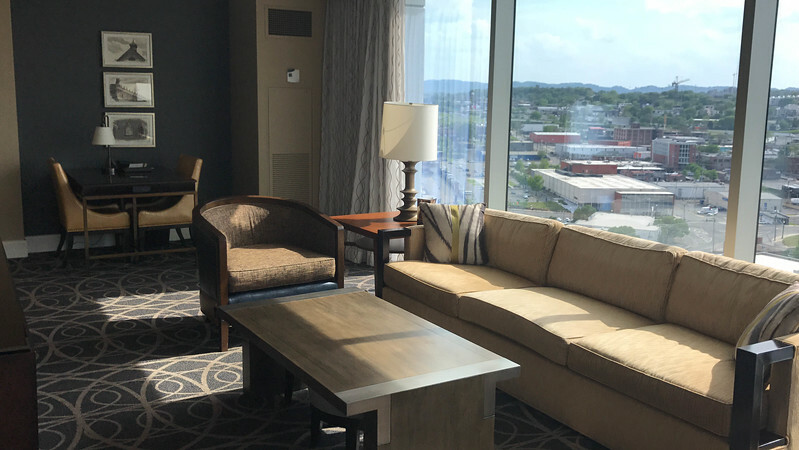 Spacious, elegant, modern, trendy and vibrant….all superlatives that I would use to describe the gorgeous suite we stayed in at the Omni in Nashville. And this doesn’t even begin to provide sufficient justice to how amazing our hotel suite really was. A gorgeous living room area with full-length windows overlooking the city of Nashville was the perfect spot to enjoy a relaxing beverage. 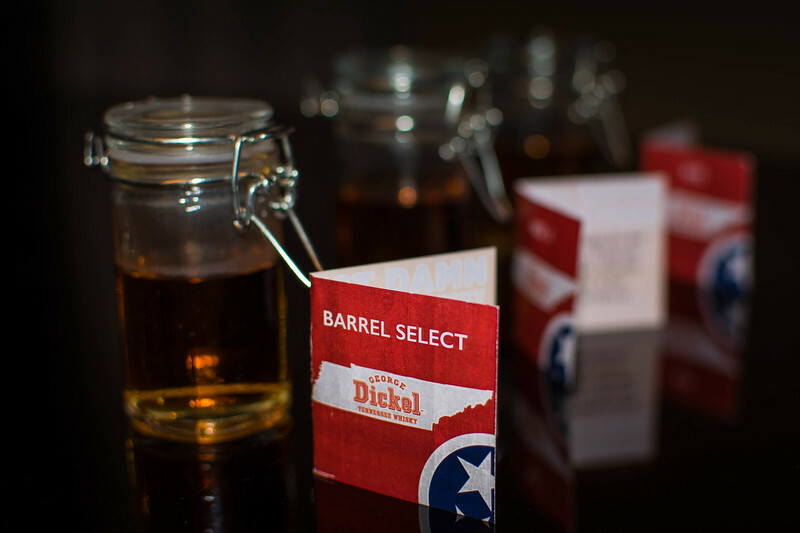 Our gracious hosts courteously left us samples of local Dickel whiskey that provided the perfect nightcap as we enjoyed the bright lights of Nashville. The living room area consisted of several work areas and the long bar table was definitely an attractive feature that Heather constantly indicates we need in our apartment now! 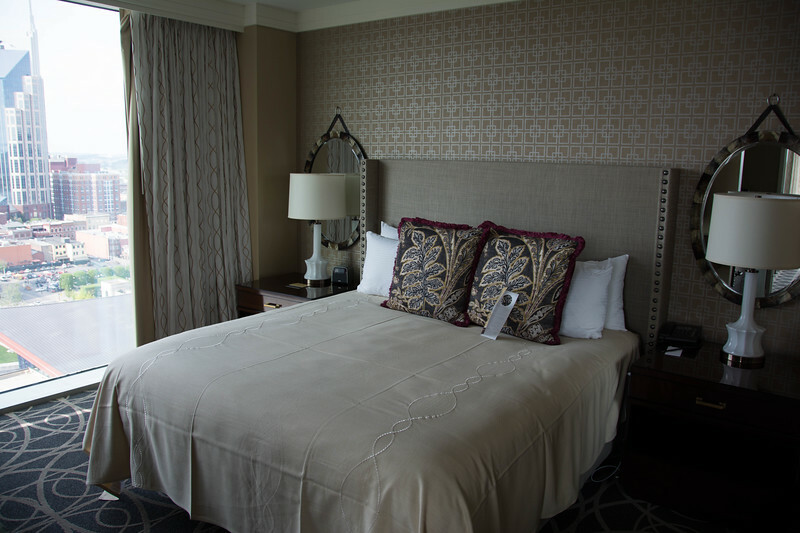 The intimate location of these suites makes them perfect for a relaxing getaway. A separate king bedroom and en suite bathroom with spacious shower, bathtub and double vanity were just an added incentive to keep us inside the hotel rather than heading out to explore Music City. 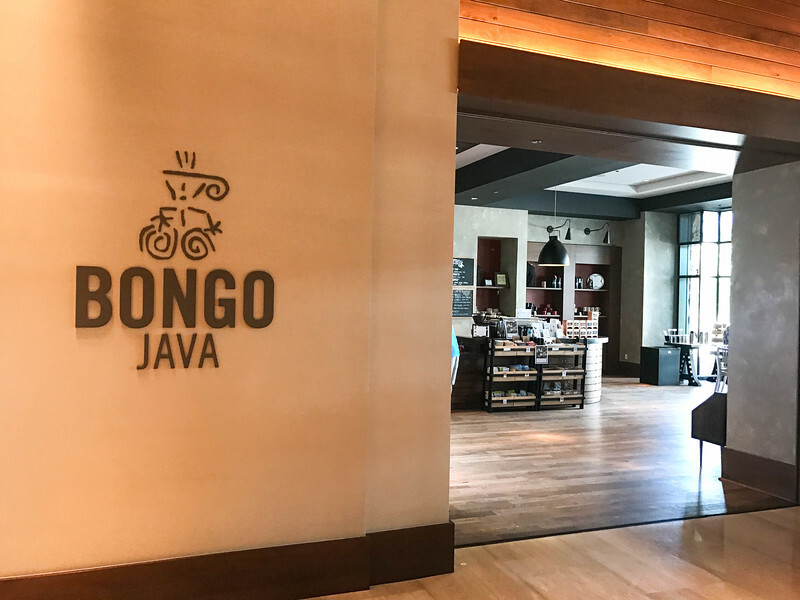 Many hotels boast a brand name coffee shop like Starbucks and for the most part, this is a nice addition for those that need to enjoy their morning espresso. 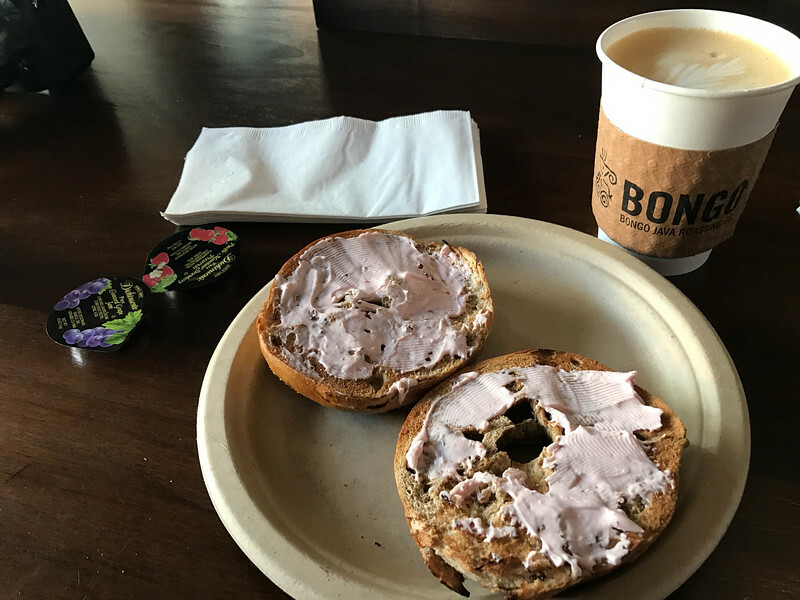 What better way to spend our Easter Sunday morning than relaxing inside this quirky yet vibrant coffee shop while sipping on a delicious espresso and sampling one of the free bagels accompanied by strawberry cream cheese. 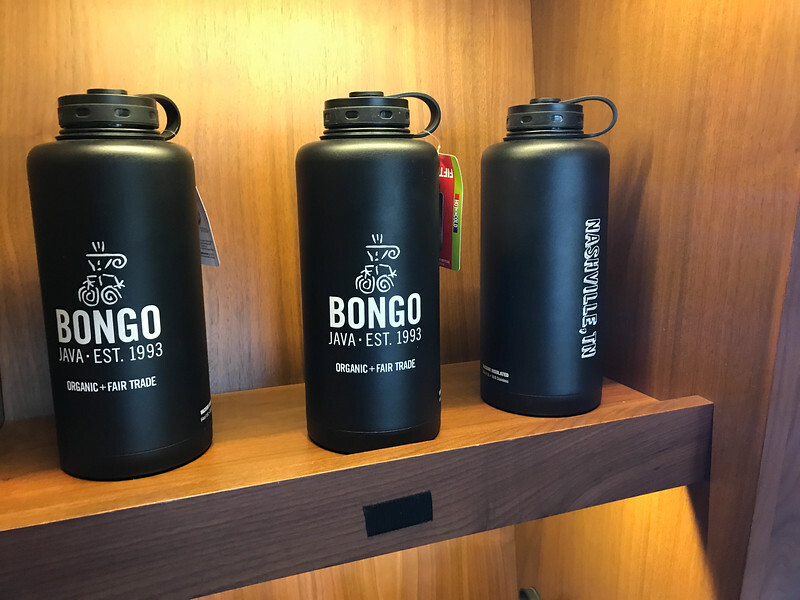 For those of you that love a traditional Americano or Macchiato, Bongo Java has everything you could wish for. However, I tend to like a little flavor and opted for one of their specialty beverages. The Broadway coffee drink is advertised as “Whisper Creek Tennessee sipping cream caramel, espresso, and milk. Let me tell you, it tasted just as good as it looks in the picture! 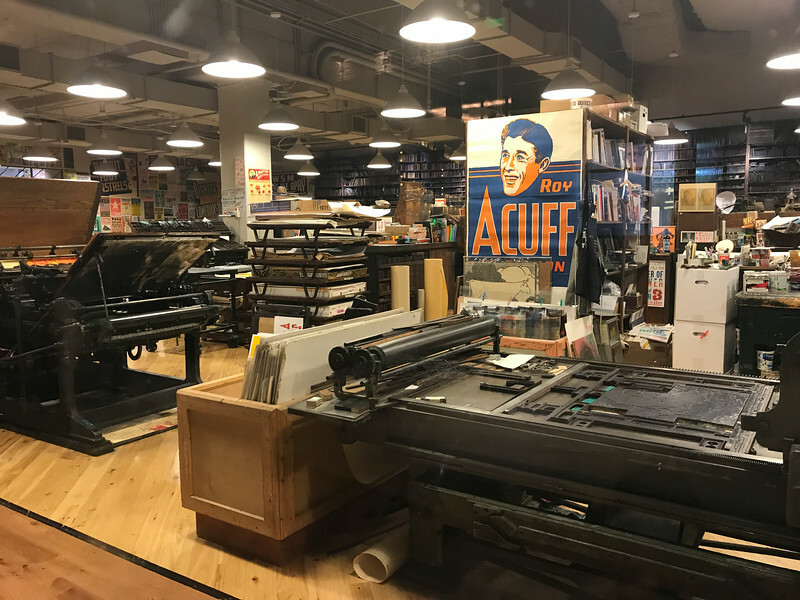 One of the most intriguing spots inside the Omni Nashville Hotel is the Hatch Show Print shop. 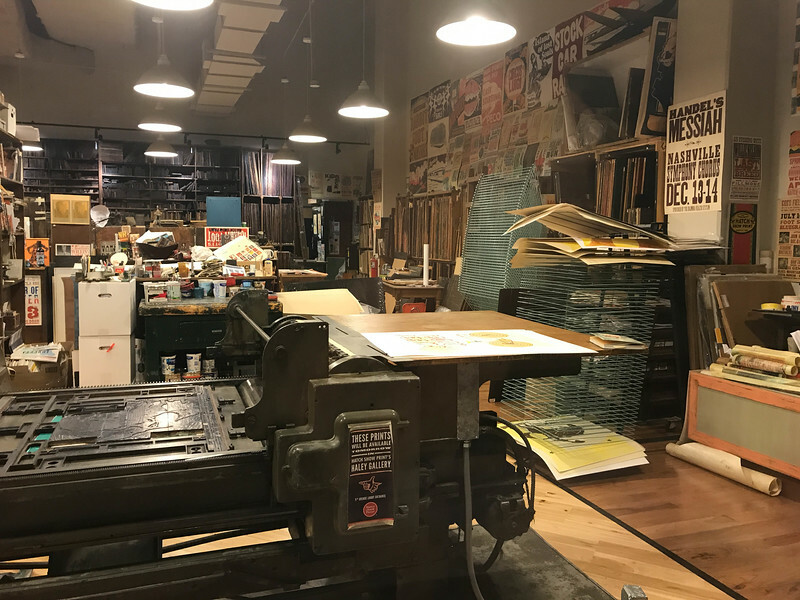 Dating back to 1879, this historic letterpress shop prints 500-600 posters every year and offers printing services on a variety of diverse projects around the Nashville area. 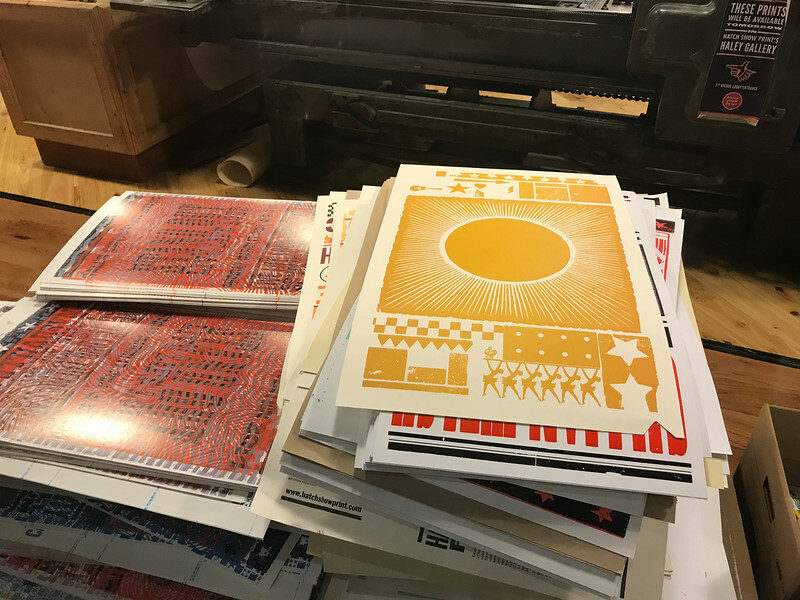 Today, visitors can explore some of the devices used to create these artwork masterpieces along with watching posters roll off the press. 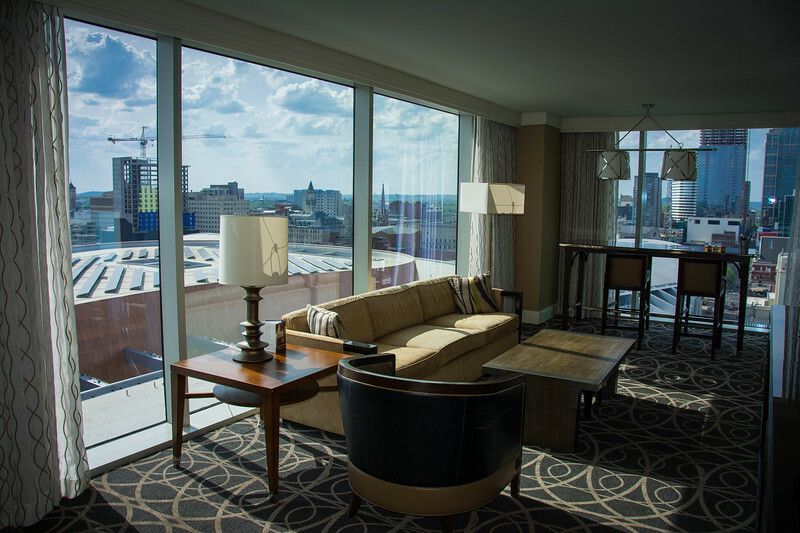 If you are not impressed by the beauty throughout this hotel suite, well you don’t deserve to stay at a hotel like the Omni! We were honored to enjoy two nights in this suite and already look forward to a return visit in the near future. 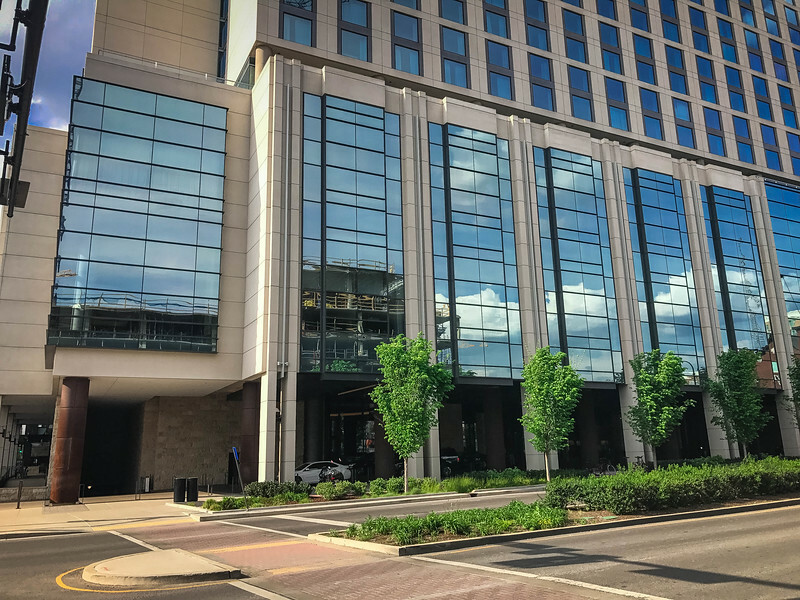 The Omni Nashville is not necessarily an affordable option for everyone and probably not the type of hotel you would stay at every time you travel. However, if you are visiting for a special occasion or looking to enjoy the “perfect” weekend getaway, look no further than this hotel. Disclaimer – We would like to thank Visit Music City and the Omni Nashville Hotel for hosting us on this trip. These are solely our personal opinions/experiences and we were not financially compensated for this post. Previous articleWeekend in St Louis – How to Enjoy an Alternative Getaway? 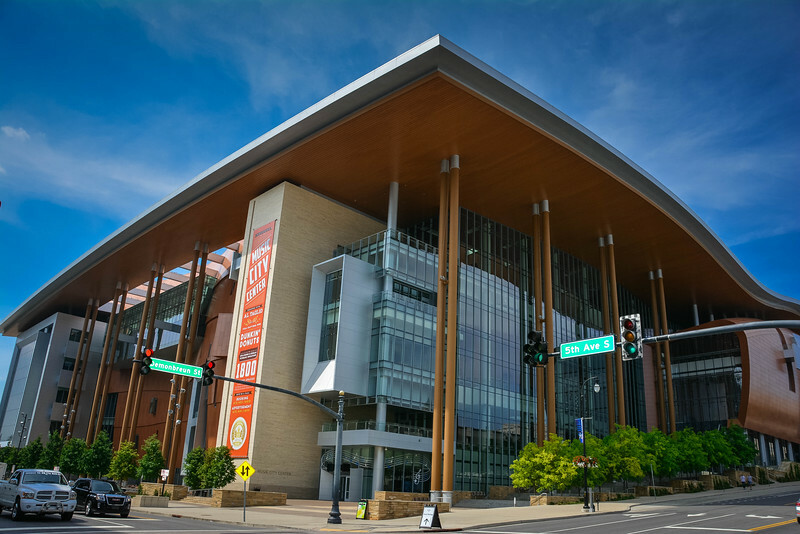 Next articleCountry Music Hall of Fame Tour – How to Enjoy the Best of Nashville? Nashville is on my bucket list. This hotel is so beautiful! Wow! Your pictures are amazing. I will have to check it out when I make it to Nashville one day. What a nice hotel! We’ll be in Nashville in the Fall after the new Kimpton Aertson opens up this summer. Going to catch a Titans game, explore the city, and make some awesome memories. We’ll consider the Omni if we extend our trip an extra day or two. Looks and sounds like a great place to stay! I especially like the lobby! Stunning!